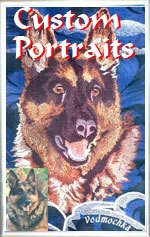 Custom Embroidery Portraits provides an exelent alternative to custom paintings. "I just wanted to tell you that my customer was beyond happy with the design, your work is truly awesome. Dawn Young"
I just wanted to let you know that I had the design you digitized for me sewn on a few garments and it looks fabulous. This is the second time I've had the design digitized. I was very happy with the results done by the first digitizer, however the shop that did the embroidery for me lost the file. That is why I had the design digitized again. I must say I was pleased with the original digitizing, but your file topped that one - the detailing is noticeably better! I got the file and the girls just finished the stitchout. You guys did such an amazing job on this one. We are all so impressed with it. Have sewn out pattern and it is perfect, looks fantastic on the hat, thank you once again for your fast service and excellent work. "Istvan, Thank you so much for the beautiful design you digitized for me. I'm sorry I was so much trouble. Next time I will forward an accurate copy of the artwork for you. This is by far the best digitized design I have ever received from anyone else, and your pricing is unbelievable. Again, Thank you so very much, Brenda Combs"
"Istvan, Thank you so very much for all of your help and expertise. You have the patience of a saint. As a returning customer, I can only reiterate my original and continued belief that your service is awesome! 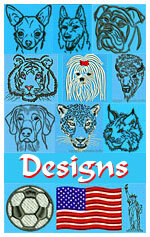 Our most popular embroidery design sample pictures - Stolen most frequently by embroidery companies to advertise themselves.